a chemical element, atomic number 20, atomic weight 40.08. (See Appendix 6.) Calcium is the most abundant mineral in the body. In combination with phosphorus it forms calcium phosphate, the dense, hard material of the bones and teeth. It is an important cation in intracellular and extracellular fluid and is essential to the normal clotting of blood, the maintenance of a normal heartbeat, and the initiation of neuromuscular and metabolic activities. Within the body fluids calcium exists in three forms. Protein-bound calcium accounts for about 47 per cent of the calcium in plasma; most of it in this form is bound to albumin. Another 47 per cent of plasma calcium is ionized. About 6 per cent is complexed with phosphate, citrate, and other anions. Ionized calcium is physiologically active. One of its most important physiological functions is control of the permeability of cell membranes. Parathyroid hormone, which causes transfer of exchangeable calcium from bone into the blood stream, maintains calcium homeostasis by preventing either calcium deficit or excess. Hypercalcemia: This is when the level of serum calcium rises above normal; neuromuscular activity begins to diminish. Symptoms include lethargy, muscle weakness (which, as the level of calcium increases, can progress to depressed reflexes and hypotonic muscles), constipation, mental confusion, and coma. The heartbeat also slows, which potentiates the effects of digitalis. Hypocalcemia: This is a serum level of calcium that is below normal; it is manifested by increased neuromuscular irritability. When there is a deficit of ionized calcium, the nerve cells become more permeable, allowing leakage of sodium and potassium from the cells. This produces excitation of the nerve fibers and triggers uncontrollable activity of the skeletal muscles. Hence, as the calcium level continues to drop, the patient begins to experience muscle twitching and cramping, grimacing, and carpopedal spasm, which can quickly progress to tetany, laryngospasm, convulsions, cardiac arrhythmias, and eventually to respiratory and cardiac arrest. Relatively early signs of hypocalcemia are a positive trousseau's sign and a positive chvostek's sign. Dietary sources of calcium include dairy products (such as milk and cheese), soybeans, fortified orange juice, dark green leafy vegetables (such as mustard greens and broccoli), sardines, clams, and oysters. The recommended dietary allowance of calcium for children aged 4 to 8 is 800 mg, and that for women aged 50 to 70 is 1200 mg. (See tables in the Appendices for recommended dietary allowances across the life span.) It is difficult to meet these requirements without including milk or milk products in the daily diet. The most familiar calcium deficiency disease is rickets, in which the bones and teeth soften. However, it is believed that a large number of people suffer from subclinical calcium deficiency because of poor eating habits. Since calcium is essential to the formation and maintenance of strong bones, an adequate intake is important in the prevention of osteoporosis. calcium acetate the calcium salt of acetic acid; administered orally as a source of calcium and as a phosphate binder, such as in patients with end-stage renal disease. Also used as a pharmaceutical buffering agent. calcium carbonate an insoluble salt occurring naturally in bone, shells, and chalk; used as an antacid, calcium supplement, and phosphate binder, and for treatment of osteoporosis. calcium channel blocker (calcium channel blocking agent) a drug such as nifedipine, diltiazem, or verapamil that selectively blocks the influx of calcium ions through a calcium channel of cardiac muscle and smooth muscle cells; used in the treatment of Prinzmetal's angina, chronic stable angina, and cardiac arrhythmias. Calcium channel blocking agents act to control arrhythmias by slowing the rate of sinoatrial node discharge and the conduction velocity through the atrioventricular node. They act in vasospastic angina to relax and prevent coronary artery spasm. The mechanism of action in classical angina is a lowering of myocardial oxygen utilization by dilating peripheral arteries and thereby reducing total peripheral resistance and the work of the heart. 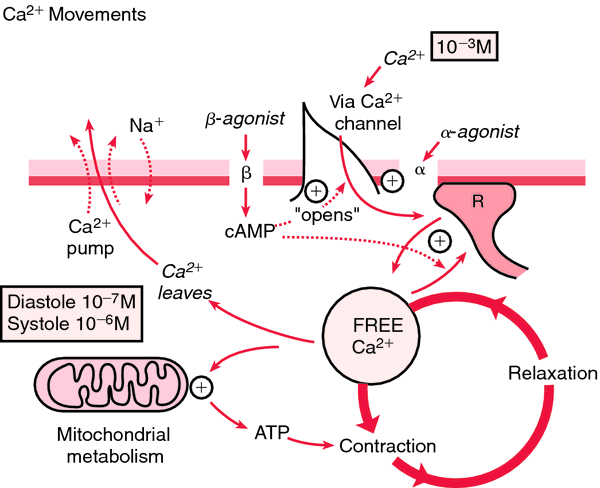 Physiologic activity of calcium channel blockers. (Data from Hardman J. and Limbird L., editors: Goodman and Gilman's The Pharmacologic Basis of Therapeutics, 9th ed., New York, McGraw-Hill, 1996; and the National Institutes of Health: The Sixth Report of the Joint National Committee on Prevention, Detection, Evaluation and Treatment of High Blood Pressure, NIH Pub. No. 98-4080, Washington, DC, GPO, 1998.) From Edmunds and Mayhew, 2000.
calcium chloride a salt used in solution to restore electrolyte balance, treat hypocalcemia, and act as a treatment adjunct in cardiac arrest and in magnesium poisoning. calcium citrate a salt used as a calcium replenisher; also used in the treatment of hyperphosphatemia in renal osteodystrophy. calcium glubionate a calcium replenisher, used as a nutritional supplement and for the treatment of hypocalcemia; administered orally. calcium gluceptate a calcium salt administered intramuscularly or intravenously in the prevention and treatment of hypocalcemia and as an electrolyte replenisher. calcium gluconate a calcium salt administered intravenously or orally in the treatment and prevention of hypercalcemia and as a nutritional supplement. It is also administered by injection as a treatment adjunct in cardiac arrest and in the treatment of hyperkalemia. calcium hydroxide an astringent compound used topically in solution or lotions. calcium lactate a calcium replenisher, administered orally in the treatment and prevention of hypocalcemia and as a nutritional supplement. calcium oxalate a salt of oxalic acid, which in excess in the urine may lead to formation of oxalate urinary calculi. calcium oxide lime (def. 1). calcium pantothenate a calcium salt of the dextrorotatory isomer of the B vitamin pantothenic acid; used as a nutritional supplement. It is also available as racemic calcium pantothenate, which is a mixture of the dextrorotatory and levorotatory isomeric forms. calcium phosphate a salt containing calcium and the phosphate radical; dibasic and tribasic calcium phosphate are used as sources of calcium. calcium polycarbophil a hydrophilic agent used as a bulk laxative. calcium propionate a salt used as an antifungal preservative in foods and as a topical antifungal agent. calcium pyrophosphate the pyrophosphate salt of calcium, used as a polishing agent in dentifrices. Crystals of the dihydrate form occur in the joints in calcium pyrophosphate deposition disease. calcium pyrophosphate deposition disease an acute or chronic inflammatory arthropathy caused by deposition of crystals of calcium pyrophosphate dihydrate in the joints and synovial fluid and chondrocalcinosis. Clinically, it may resemble numerous other connective tissue diseases such as arthritis and gout, or it may be asymptomatic. Acute attacks are sometimes called pseudogout. calcium sulfate a compound of calcium and sulfate, occurring as gypsum or as plaster of paris. Drug group that inhibits calcium movement; used to treat hypertension, angina pectoris, and cardiac arrhythmias. Differential effects of calcium channel blocking agents on oxygen consumption rate in vascular smooth muscle. At least some calcium channel blocking agents appear to be effective in blocking migraine attacks. 5,435,998) covers the treatment of low-tension glaucoma by topical administration of class I calcium channel blocking agents.